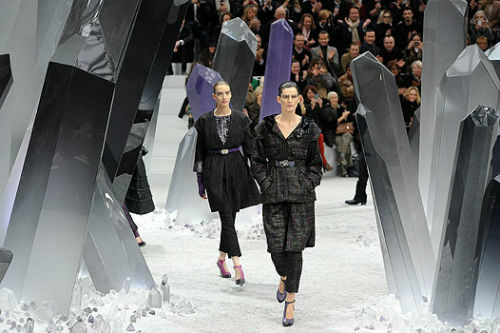 Karl Lagerfeld invited his guests to the mysterious cave, with transparent white, gray, purple crystals everywhere… The models were dressed in the clothes of the same colors (and their derivative shades), although the catwalk was dominated by the black, a clear favorite in the new season. 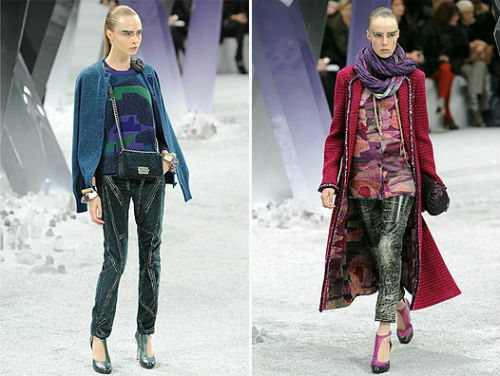 The Chanel line was dominated by over-sized models – all the belted items seemed too big for the models. 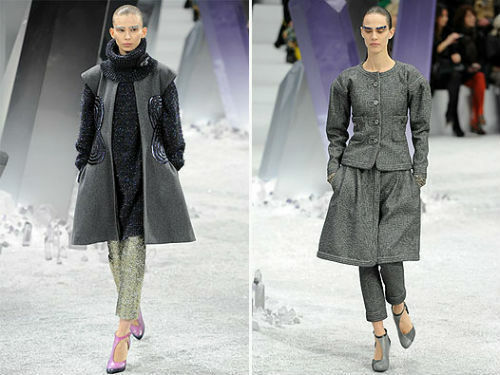 In addition, the designer offered multiple layers: pipe pants with skirts or dresses and even jackets and coats on top of them. 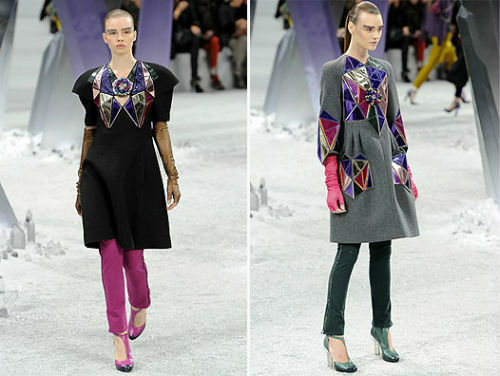 Kaiser Karl completed the images with the help of spectacular accessories: massive bracelets, leather mitts, small bags with embroidery, and shoes on transparent crystal heels. 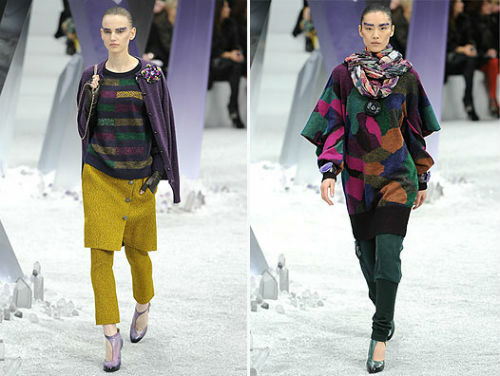 Weekend outfits are represented by light printed sundresses, as if painted in purple, emerald green, blue and dirty-yellow watercolor, as well as original outfits (dresses, coats, jackets) with embroidery depicting the contours of the same gems. By the way, all these things are again offered in a combination with trousers. 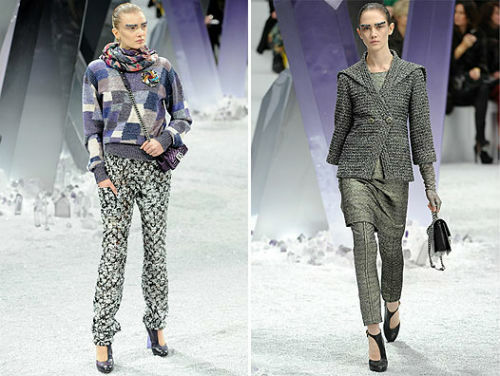 As for the evening looks, they included overalls with golden mesh, lace pants, and transparent skirts, which Lagerfeld mixed with bright silk blouses. 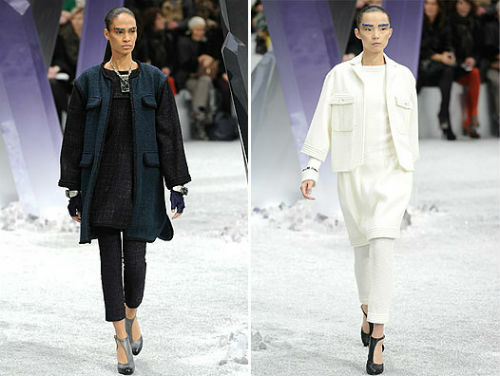 Those, who love “classic” Chanel, must admire the gorgeous costumes of fine wool, complemented by futuristic necklace collars. 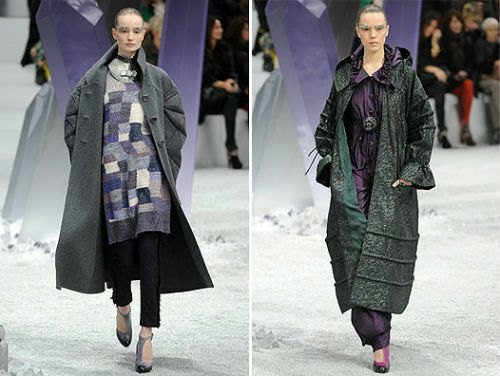 Innovators are sure to appreciate the “crinkle” models of shiny fabric trimmed with feathers, which finished the showing.